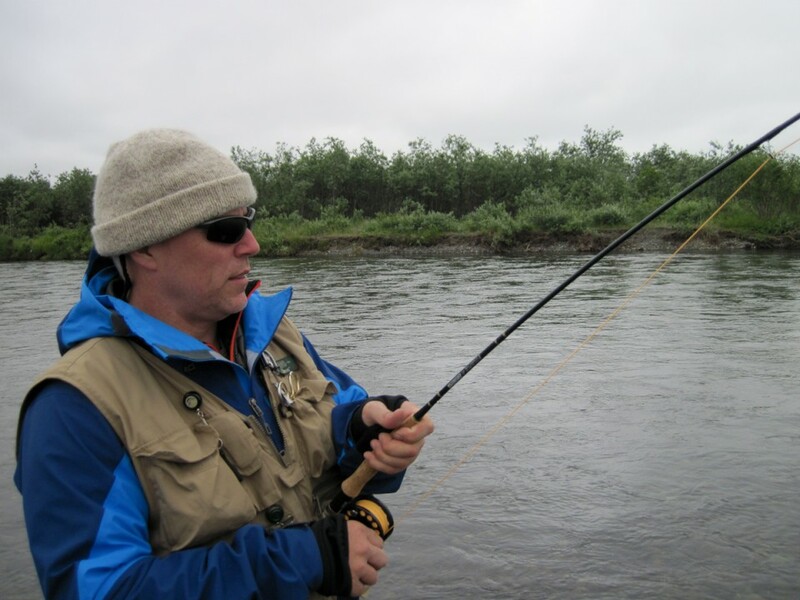 Brent Whitney returned for another Alaskan fly-fishing adventure with Dolly Trinidad and was joined by Sam Carlisle and Lucas Wolfe. Our first hours on the Middle Fork set a standard that will be hard to “over top” in future years. We gazed at many dozen Sockeye porpoising and resting below a small gravel bar along a seam created by the swift current and the still water. 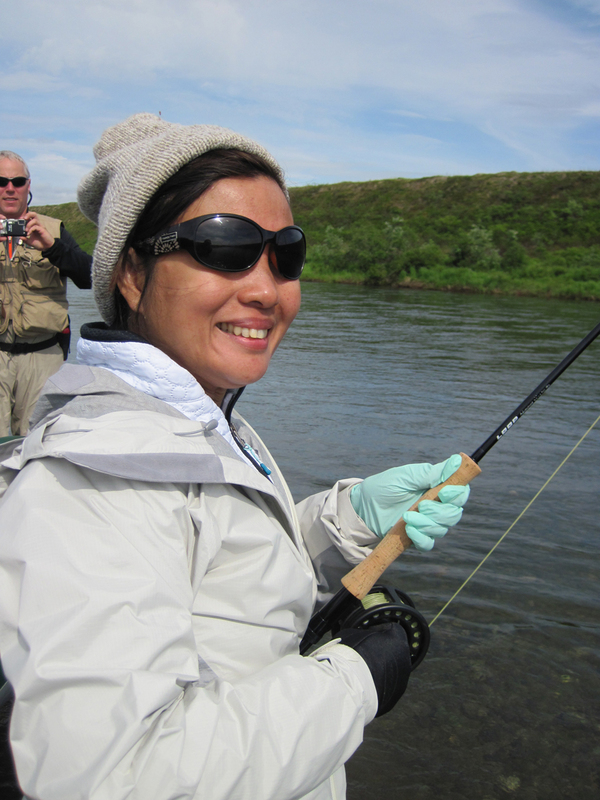 It was a cool-marine layer evening when it felt good to remain in waders and jackets and for Dolly Trinidad, who’d never seen a salmon, it was particularly interesting. 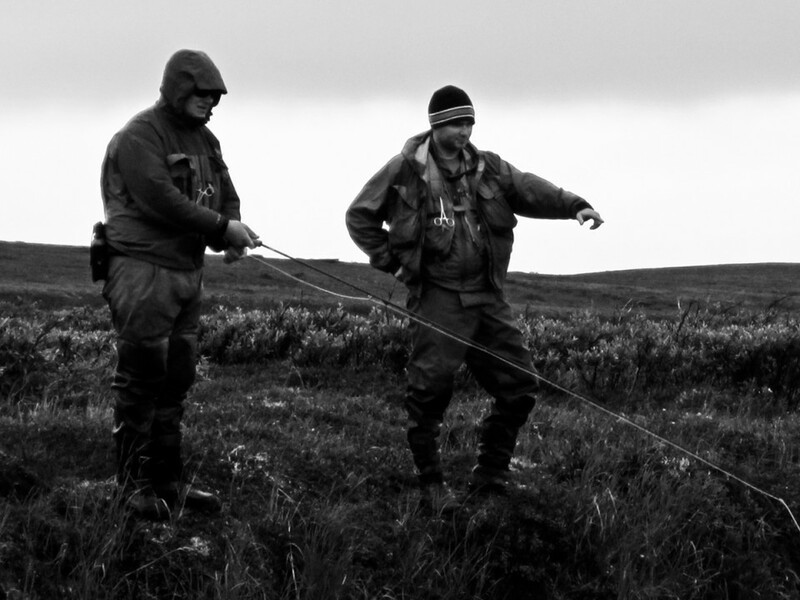 For Sam Carlisle, an Atlantic Salmon angler who’d come from Great Britain the abundance was poignant. All through July the numbers of Sockeye salmon have increased as waves of fish entered the river and now they are staged near spawning beds, maturing and beginning courtship. The life cycle was on display but that is common to the Bristol Bay and why we come. The unexpected happened next. The amazing drama was a pair of adult brown bears mating in our view. Brent who’d travelled with me among Brown Bears on a previous trip passed his binoculars around. The bears were not just courting one another and sharing pre nuptial affections but they were consummating the affair as we watched. Alaska always has surprises! We were awestruck. Afterwards they slowly moved off grazing and meandering side by side quite blissfully oblivious to the world around them. From the log of July 25, 2012. 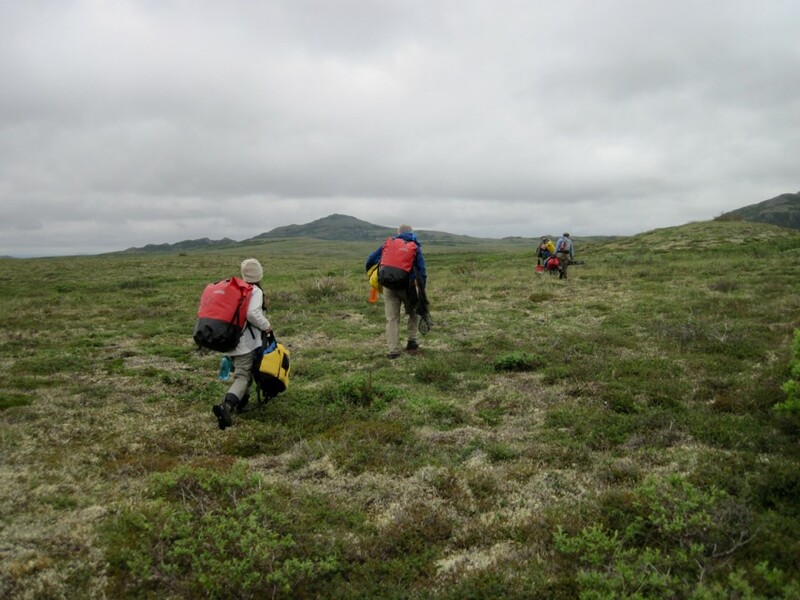 “The middle fork is so sublime flowing through the tundra hills below the Ahklun Mountains. The water level has apparently dropped one foot this past week but is still higher than normal. The mating bears were seen again mid afternoon on river left, aware only of one another. Skies were grey with misting rain and small low clouds scudding by across the hill tops. 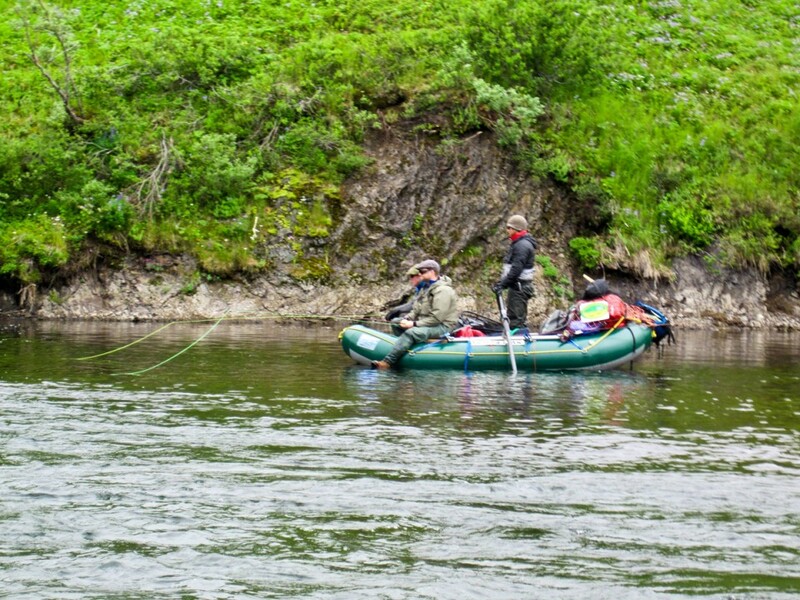 A pair of Long Tailed Jaegers behaved defensively as we passed by in the raft and Sam was keen to see the species for the first time.” The fishing was not easy in the high cold flows but 8 Grayling, 5 Sockeye, some Chum Salmon, and 3 Rainbow Trout were released. 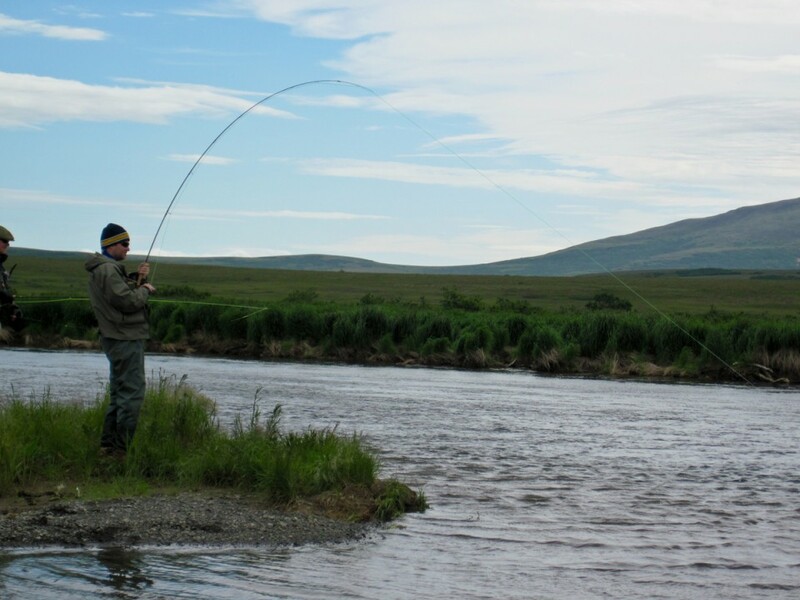 As the river gathered tributaries the fishing got stronger mile after mile. We camped on a gravel bar on July 26’Th distinguished by the presence of spawning Chum Salmon and then the sun broke out for dinner and was brilliant. Some very large Char associated with the salmon were taken including the largest Dolly Varden so far this season by Dolly Trinidad. Dolly, at the time, was working on her casting, putting together the rhythm of the cast, and the drift, then lifting to recast. 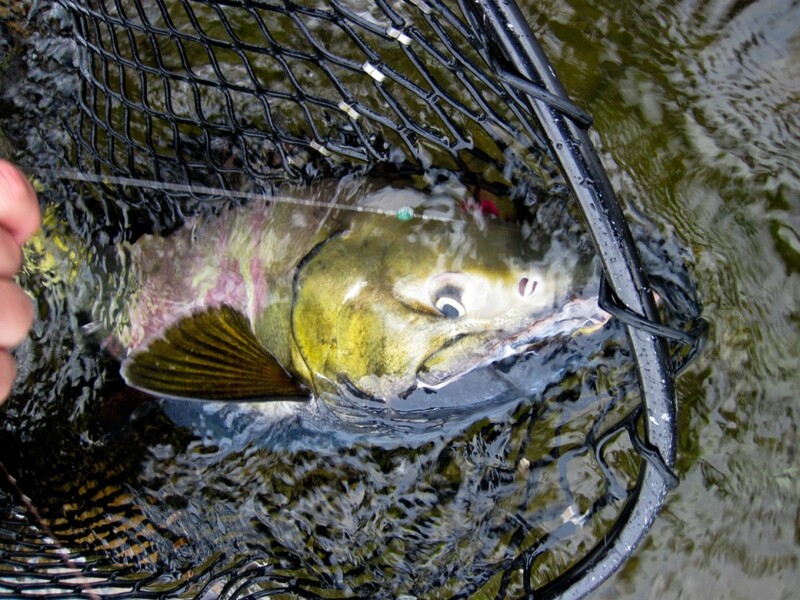 She set the hook in an exceptional large male Char and eventually brought it to the net. 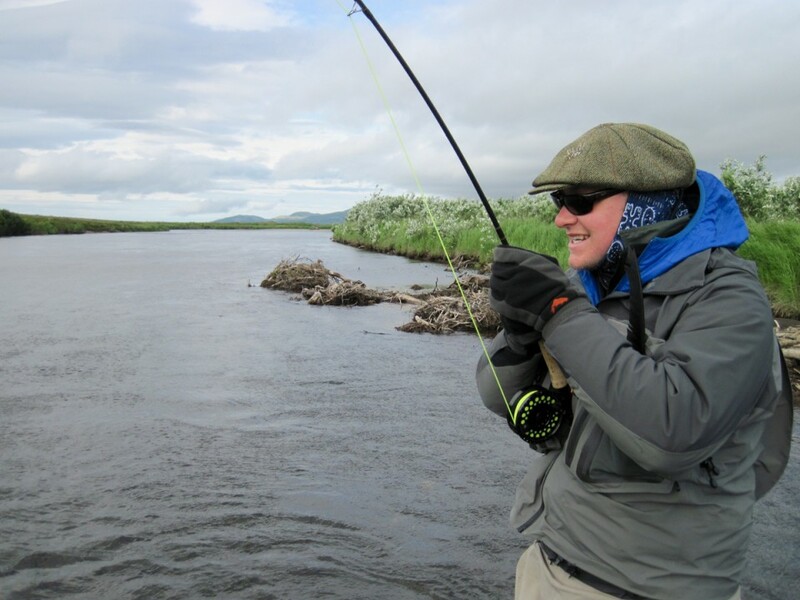 She’d come to Alaska for the first fly fishing trip of her life and was making progress now! The gift of a trip by raft like this is that over the course of hours and days we conversed about all the subject matter of importance. As we cast for Char and Trout and Salmon, watched wildlife, while the tundra hills scrolled by we compared stories of growing up and of careers and family. One remembers these discussions in association with the landscape and the shrieking Arctic Terns as they plunged into the river water. “Lumbering unsteadily across a shallow slough and up a steep gravel bluff, a young Brown Bear limped on 3 legs”. He was likely 4 years old and probably had been shot in the foreleg recently. I wish it wasn’t so, but in truth it happens. Brown Bears living around coastal Alaska get shot at and it’s not unusual at the end of an adult bears life, many years later, to find an old healed over rifle wound(s). From a really beautiful camp on an oxbow with a bluff extending in an arc partly around us we watched the hurt young bear move off. That camp where we saw the crippled Brown Bear was where “biological clock” of the Salmon cycle and river morphology came together for us at the peak of the Chum Salmon Spawn. 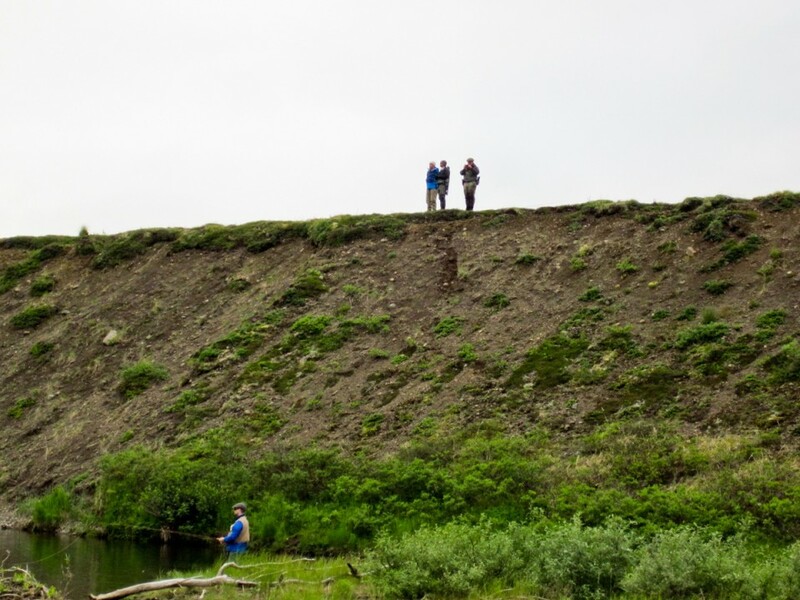 Above camp there was a spectacular spawning channel loaded with Chum and Char. We fished the “Chum Beds” as we rafted into camp and then walked back from camp and fished again. 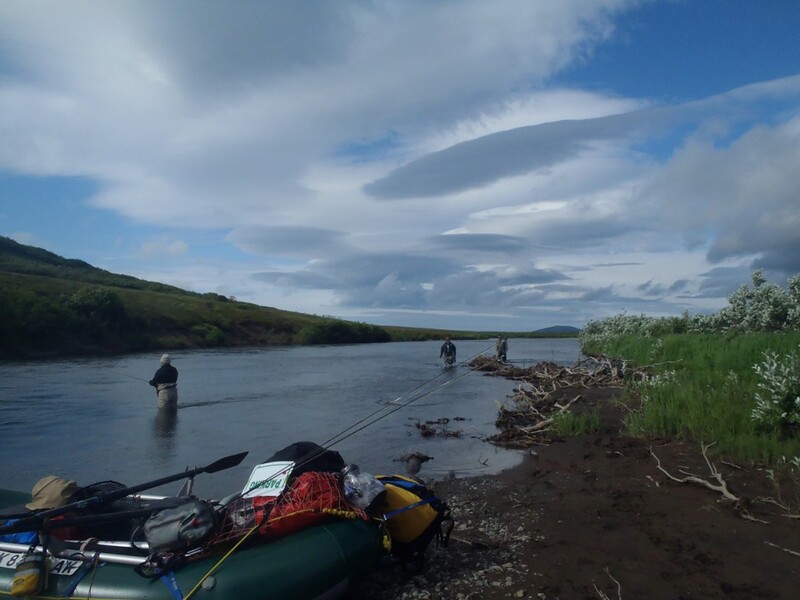 For every trip down a major salmon river in the Bristol Bay there comes a point where your raft intersects the peak of the spawn or perhaps the vanguard arrival of the salmon run. That point in time and space where the peak will occur can’t be precisely predicted. 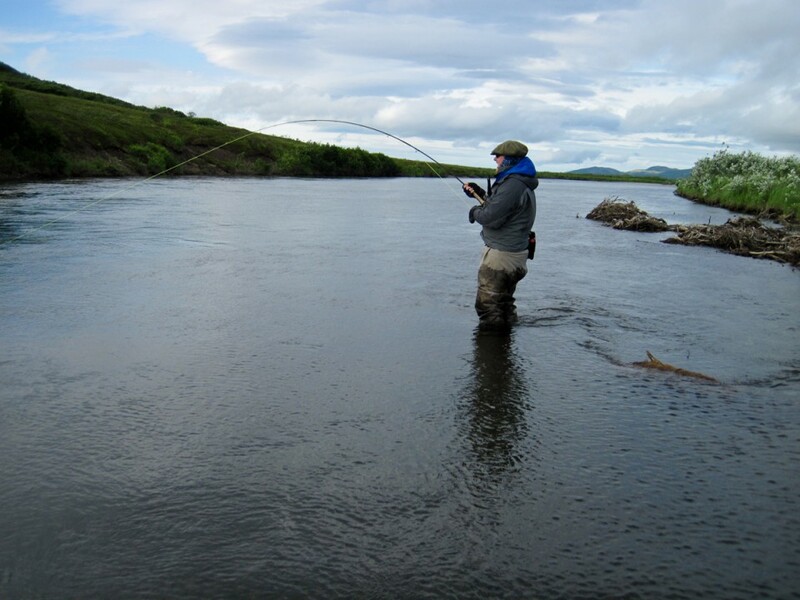 So the challenge is for you to find that place and the only way is to float the river searching with fly rods, and observing where the fish are arrayed. 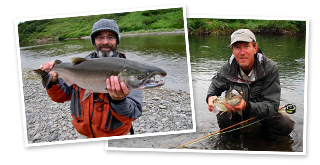 Some spectacular Salmon fishing occurred as we finished up our trip. Sam Took a tremendous fish in front of a beaver lodge in the lower river. It was very dramatic. The backdrop of the ragged grey sky, the ancient looking Beaver lodge which was the creation of many, many generations of Beavers. 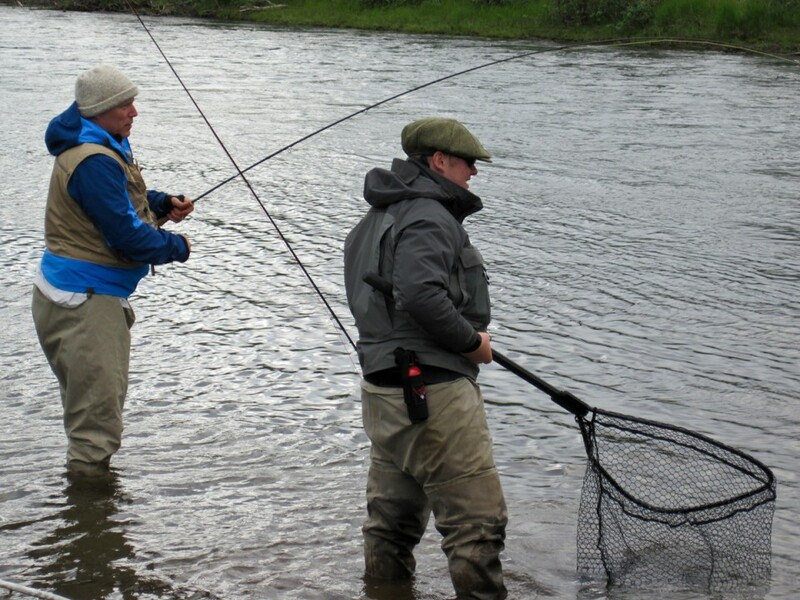 Other salmon were hooked and lost there. It was all quite wild. And then the wind really began to blow down from lenticular clouds and race down the slopes of the mountain. 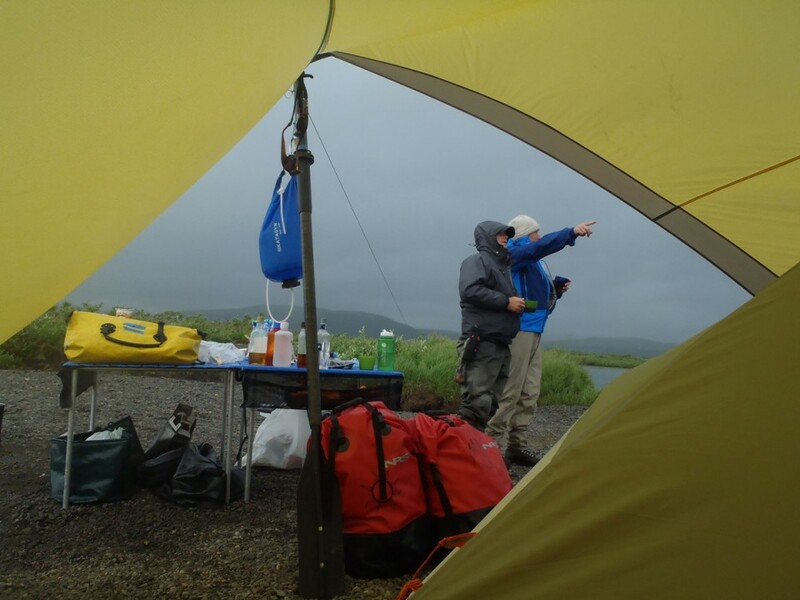 We built camp in an intense wind and rain squall a couple miles upstream of the confluence with the North Fork of the Goodnews to be out of range of the tidal influence. We chose a lee behind willows and rigged both rafts as wind breaks. It was one of those affairs, which required at least 4 sets of hands to hold and stake out each tent. But a comfortable camp was created. Fresh salmon cooked with fettuccini and pesto made a nice supper for our last night. A glass of wine. It was perfect.